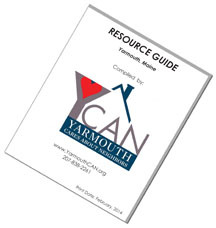 The Transportation Options Pamphlet (published by Yarmouth Aging In Place) lists all options available, including the Rides Program described below. to attend movies at Merrill Library, YCS Field Trips, etc. Five business days (or more) notice are required to arrange transportation. Rides may be limited to FIVE PER MONTH per individual. Rides to medical appointments outside of Yarmouth may be limited to ONE PER MONTH. Rider will be given a 48-hour notice if request can not be filled so that other arrangements can be made. Ride request via phonecall are accepted from 9:00 a.m. to 3:00 p.m. Monday thru Friday. The YCAN Rides phone is not answered on weekends. Maureen Brosnan: (207) 835-9866. She is Yarmouth’s Community Resource Specialist from SMAA (Southern Maine Agency on Aging). Connect with her to find out all resources that may be available.